Today in our poetry news roundup we take a look at the memorial events planned for Endre Ady, and the Irish Ambassador with a Twitter feed full of poetry. Sunday 27th January marked the centenary of the death of the Hungarian poet, Endre Ady. 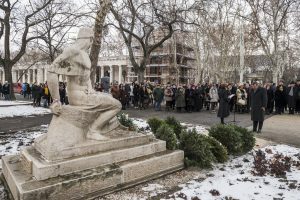 Lawmakers and heads of several of the cultural institutes of Hungary gathered at the poet’s tomb, which is located at the Cemetery on Fiume Street in the country’s capital city of Budapest. 2019 has been dedicated a memorial year to the poet. A commemoration was held at the poet’s statue by the Socialist party, with a speech being given during which people reminded that in addition to being a poet Ady was a journalist of some note and wrote about issues such as hate-mongering against Jewish people and corruption. There are several other commemorations planned in honour of the poet; these include a walk during which participants will be guided around the capital and many of the poet’s memorial sites. There will also be a memorial evening at the Hungarian Academy of Sciences, exhibitions and a few TV broadcasts have been planned. The Irish Ambassador to the US, Daniel Mulhall, likes to begin each day with a tweet. Mulhall’s tweets are full of poetry, predominantly Irish poetry, and are uplifting. It could be said that they are his diplomatic weapon choice; they have landed him a place on the Lincoln Centre stage this spring. 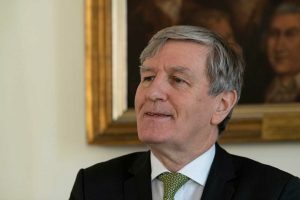 Mulhall believes that it is an important part of his job is to tell people about the story of Ireland, and he finds that there is no better way to do this than through poetry and history. Through his job, Mulhall has been stationed in countries all over the world. When he was in India attending a dinner hosted by a politician who was the sister of the first prime minister of India, he sat in awe as all the other guests on learning that he was Irish began reciting the words of a poem by W.B Yeats. It as then that he realised just how global good poetry could be. As he moved from one post to the next, he began to incorporate his love of Irish literature into his work, giving lectures of Yeats, James Joyce, Samuel Beckett and a number of other Irish poets. In 2015 he was stationed in England. At the time, Ireland was celebrating the 150th anniversary of the birth of Yeats, and Mulhall discovered twitter. He started making a daily tweet dedicated to the poet. At the end of the yea,r he planned to stop but the many followers he had collected begged him to carry on. His choice of poets and writers has expanded now and includes the 17th century satirist Jonathan Swift and up and coming novelists like Caoilinn Hughes. He even tweets American-poet-inspired content on special occasions on the American calendar. This passion for poetry has earned him an invitation to the 16th annual poetry celebration at the Lincoln Centre on 24th April this year.